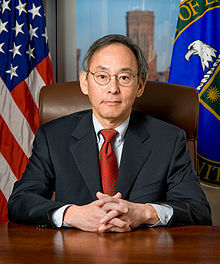 Steven Chu (born February 28, 1948) is an American physicist. He was the 12th United States Secretary of Energy from 2009 to 2013. Chu is known for his research at Bell Labs in cooling and trapping of atoms with laser light, which won him the Nobel Prize in Physics in 1997, along with his scientific colleagues Claude Cohen-Tannoudji and William Daniel Phillips. Chu is the first Nobel Peace Prize winner and the second Chinese American to hold a post in the United States Cabinet. Before becoming the United States Secretary of Energy, he was a professor of physics and molecular and cellular biology at the University of California, Berkeley. He was also the director of the Lawrence Berkeley National Laboratory. Before teaching at Berkeley, he was a professor of physics at Stanford University. He has argued for more research into alternative energy and nuclear power. He thinks the world should shift away from fossil fuels to help with climate change. For example, he discusses a global "glucose economy". This is a form of a low-carbon economy, in which glucose from tropical plants is shipped around like oil is today. Chu was born in St. Louis, Missouri. He has ancestry from Taicang, Jiangsu. He attended and graduated from Garden City High School. He received both a B.A. in mathematics and a B.S. in physics in 1970 from the University of Rochester. He went on to earn his Ph.D. in physics from the University of California, Berkeley, in 1976. He wrote a paper on gravitational redshift published in Nature (463, 926–929) in Feb 2010 and a second one co-authored in July 2010. Under his leadership in 2010 the Department of Energy updated the water usage regulations on toilets and showers. His nomination to be Secretary of Energy was unanimously confirmed by the United States Senate on January 20, 2009. On January 21, 2009, Chu was sworn in as Secretary of Energy in the Barack Obama administration. In March 2011 Chu said that federal regulators should not delay approving licenses for construction for planned U.S. nuclear power plants because of the Fukushima nuclear disaster. "I think those things can proceed", Chu told reporters on Capital Hill, referring to construction license applications pending at the U.S. Nuclear Regulatory Commission. In August 2011, Chu praised an advisory panel’s report on curbing the environmental risks of natural-gas development. Chu responded to the panel’s report on hydraulic fracturing. Hydraulic fracturing breaks up rock to get more oil and gas out of the ground. The report recommendations include: greater data collection of air and water data, “rigorous” air pollution standards and mandatory disclosure of chemicals used in the hydraulic fracturing process. “The report ... recommends a range of tools for implementing these measures, including regulation, continuous improvement in best practices by industry, and ongoing research and development,” Chu said in a statement. “I will be working closely with my colleagues in the Administration to review the recommendations and to chart a path for continued development of this vital energy resource in a safe manner,” he added. Republicans in Congress have accused Chu for changing a US$535 million federal loan to Solyndra, an energy company. When the company went bankrupt in 2011, the government lost the money. A House Energy and Commerce subcommittee asked Chu in 2011 about the loan. ↑ 2.0 2.1 Tore Frängsmyr, ed. (1998). "Steven Chu Autobiography". The Nobel Prizes 1997. Les Prix Nobel. Stockholm: The Nobel Foundation. Retrieved 2007-06-25. ↑ Jake Tapper (2008-12-11). "A Nobel Prize Winner in the Cabinet". ABC News. Retrieved 2009-03-23. ↑ Sky Canaves (2009-02-26). "Commerce Nominee a Locke In China". The Wall Street Journal. Retrieved 2009-03-23. ↑ "Dr. Steven Chu, Secretary of Energy". United States Department of Energy. Retrieved 2009-02-24. ↑ H. Josef Hebert (2008-12-08). "Energy secretary pick argues for new fuel sources". Associated Press. Retrieved 2010-11-09. ↑ Directors of DOE National Laboratories (August 2008). "A Sustainable Energy Future: The Essential Role of Nuclear Energy" (PDF). Department of Energy. ↑ "A scientist who is on tap, on top". St. Petersberg Times. July 26, 2009. Retrieved January 10, 2010. ↑ Bert Eljera (1997-10-23). "Stanford Professor Steven Chu graduates to the rank of Nobel laureate". AsianWeek. Retrieved 2013-12-31. ↑ Brendan John Worrell (2009-07-15). "Steven Chu: US ready to lead on climate change". ChinaDaily. Retrieved 2013-12-31. ↑ Kathleen Kerr (2008-07-16). "They Began Here". Newsday. Retrieved 2013-12-31. ↑ Borestein, Seth (2010-07-07). "Energy secretary's hobby is nano science". MSNBC. Associated Press. Retrieved 2010-07-12. ↑ Pertsinidis, Alexandros; Yunxiang Zhang, Steven Chu (2010). "Subnanometre single-molecule localization, registration and distance measurements". Nature. advance online publication (7306): 647–51. doi:10.1038/nature09163. ISSN 1476-4687. PMID 20613725. ↑ "Time for a Shower (Before It's Too Late) - The Weekly Standard". ↑ Nicholas Johnston (2009-01-20). "Senate Confirms Seven Obama Nominees, Delays Clinton". Bloomberg L.P. Retrieved 2009-01-25. ↑ "Japan crisis should not delay new U.S. reactors: Chu". Reuters. 2011-03-15. ↑ "Chu vows to 'chart a path' for safe gas drilling". ↑ Wald, Matthew L. (16 November 2011). "Energy Secretary Steven Chu to Defend Solyndra Loan to Congress" – via NYTimes.com. ↑ Samuelsohn, Darren. "GOP grills Chu on Solyndra". POLITICO. Wikimedia Commons has media related to Steven Chu. This page was last changed on 14 February 2019, at 13:23.